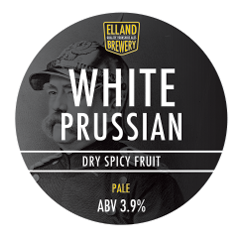 Customer pressure wins and we have agreed finally to introduce White Prussian to keg. Trials are currently underway and the product after intense testing will be in a few selective accounts from next week for the purposes of customer feedback. Initial tastings have been very successful but we will await the results of the paying customer before committing fully to increased output. Check the site to see where you might taste it, with the opportunity to win some brewery merchandise as a thank you for providing some insightful feedback. 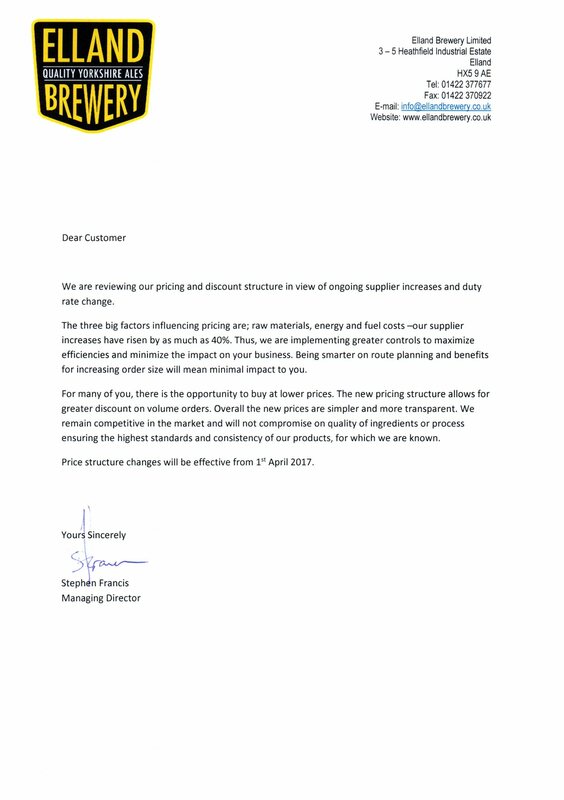 Managing Director, Stephen Francis announces the Companies first price increase in over three years. 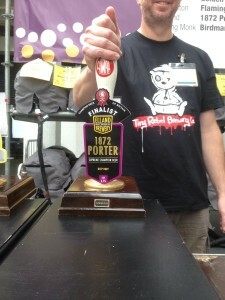 We are very pleased that our 1872 Porter reached the final at CAMRA GBBF. Unfortunately we did not win, losing out to Binghams Vanilla Stout, brewed in Berkshire. 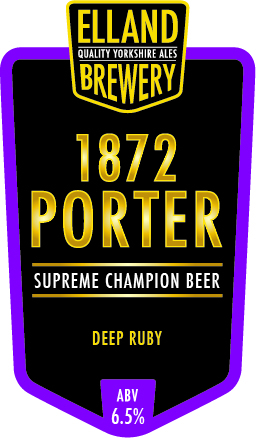 Our 1872 Porter is arguably the most decorated beer in recent British brewing history. A rich, complex, dark ruby beer from a Victorian recipe. It has an old port nose, coffee and bitter chocolate flavours from four malts including finest Maris Otter and English hops. Supreme Champion Beer of Britain. Three times National Winter Ales Champion. 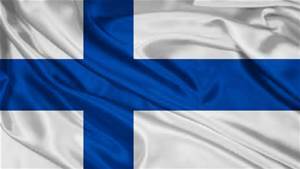 Former regular at the Junction in Castleford and most certainly a lover our beers, Janne Lehvonen recently spotted our Blonde in his home country of Finland. Yet another discovery and a reminder of his adopted county of Yorkshire. 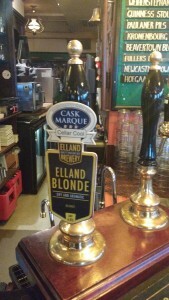 Elland Blonde is a 4.0 ABV easy drinking blonde ale. Dry and aromatic yet uncomplicated. Soft bitterness and light citrus notes from a combination of English Progress and American Cascade hops. 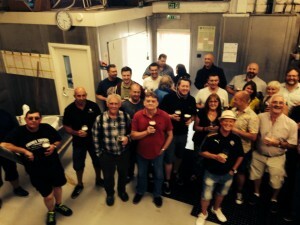 We were recently pleased to host a visit from the regulars at the Junction pub at Castleford. Run by Maureen Shaw and Neil Midgley, the pub is known locally, nationally and internationally for being the only pub to serve all the cask beers from its own wooden casks. We are proud that our beers feature frequently at the pub in the wood. Amongst the beers on offer on the day was our award winning 1872 Porter from a wooden cask. We are pleased to support the Brewers Pride at Healey, Ossett with their annual Yorkshire Air Ambulance Fund Raising Beer & Music Festival over the weekend of 30th & 31st July. We will be supplying three beers – Nettlethrasher, Beyond the Pale and Chinook. We are donating the Chinook in support of the worthy charity. 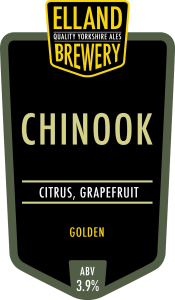 Chinook is a golden, single hopped golden session beer at 3.9% ABV with a hint of spice, strong citrus and grapefruit aroma and flavours. 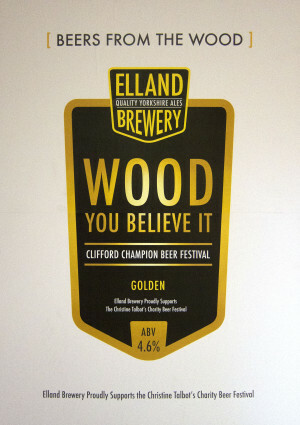 Clifford Champion Beer Festival – Wood You Believe It! We are pleased to have sponsored and provided two Festival Special Beers in the Wood (casks courtesy of the Junction at Castleford). 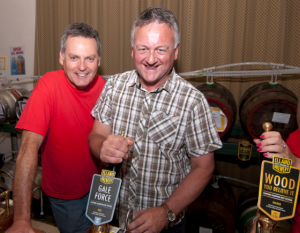 The two beers were Gale Force were brewed for and named by ITV Calendar Weather presenter Jon Mitchell and Wood You Believe It (in the wood) brewed for ITV Calendar presenter Duncan Wood. Gale Force was a 5% IPA easy drinking pale ale brewed with US and NZ hops that give a combination of fruit flavours. Wood you believe was a 4.6% premium golden bitter with fruity citrus flavours and aroma. 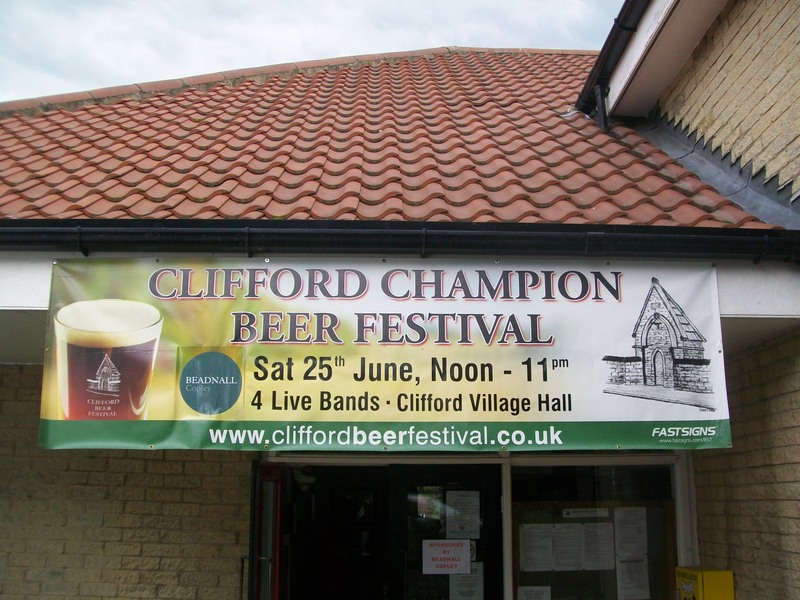 A unique head to head is kicking off at Clifford Champion Beer Festival on Saturday 25th June. 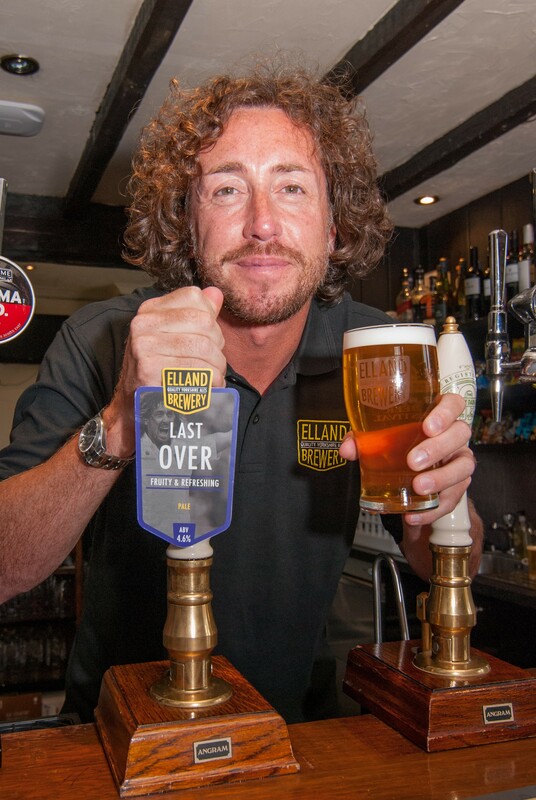 Championship winning brewers Elland have come up with two one off special brews for well known YTV Calendar presenter Duncan Wood and weatherman Jon Mitchell. I headed off to the brewery for a sneak preview of Jon Mitchell’s Gale Force IPA, a 5% IPA easy drinking pale ale brewed with US and NZ hops that give a combination of fruit flavours. While we were there I also had a taste of Duncan Wood’s Wood you believe it which is a 4.6% premium golden bitter with fruity citrus flavours and aroma. Although both beers were very good, they always taste better at the brewery. I personally thought Jon was right, although my preference won’t be the same as everyones. What will be interesting is the opportunity for people to taste both these beers from the wood, something we are trying to support at Clifford Beer Festival. This year, thanks to Elland Brewery and The Junction pub, Castleford, ‘the home of beers from the wood’ we have been able to put four Elland beers on the bar in wooden casks. As well as the two festival specials there will be the championship winning 1872 Porter and Beyond the Pale. There will also be a Sunbeam Ales Chocolate mild which was brewed for the Leeds mild fest in May and has been conditioning in the wooden cask with the unique Sunbeam Ales logo on ever since.